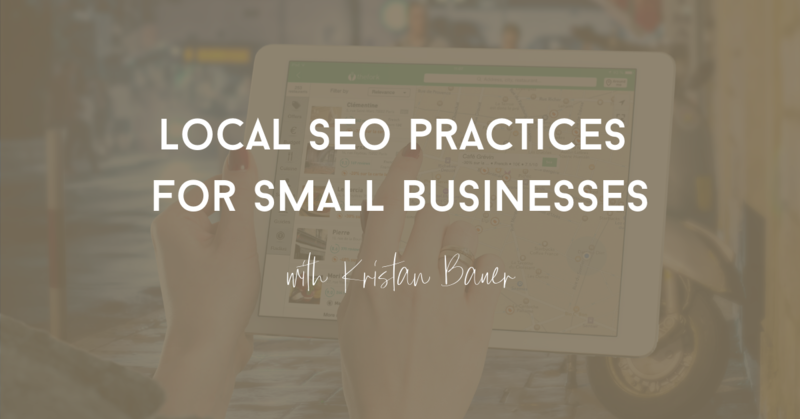 Learn essential local SEO practices that any small business or local business needs to implement today. Understanding local search engine optimization (SEO) best practices is crucial for small businesses. Improving your local SEO presence not only means more web traffic but also more direct customers. Local SEO tactics are slightly different than typical SEO practices because they rely more heavily on business information, local signals and location. 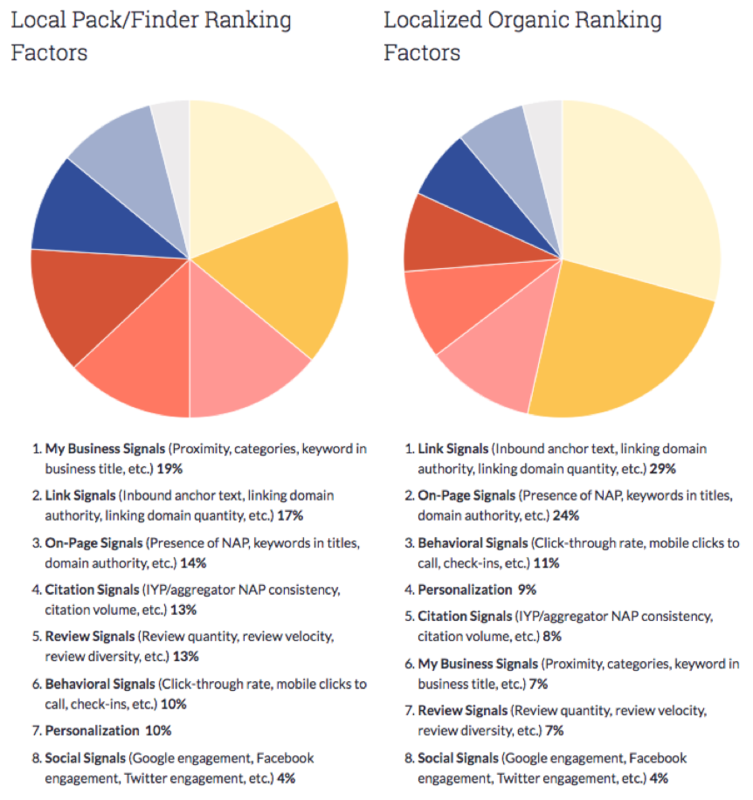 Moz.com publishes an annual report on local search ranking factors, which includes the top local SEO influencers. Overall, these signals are roughly the same across the local map pack and the local organic results, but they are prioritized differently. The good news is that with some targeted effort, small businesses can create an optimized and visible presence for local customers on organic search. 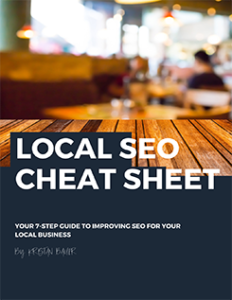 Below outlines nine essential local SEO practices for small businesses based on local search ranking factors. 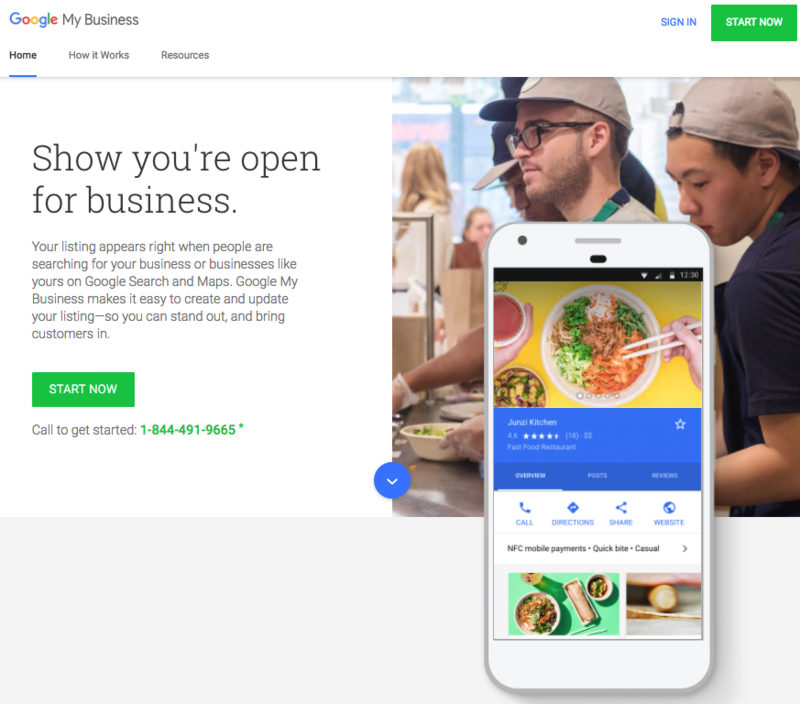 Setting up your Google My Business (GMB) listing is one of the most important things you can do for your local business. 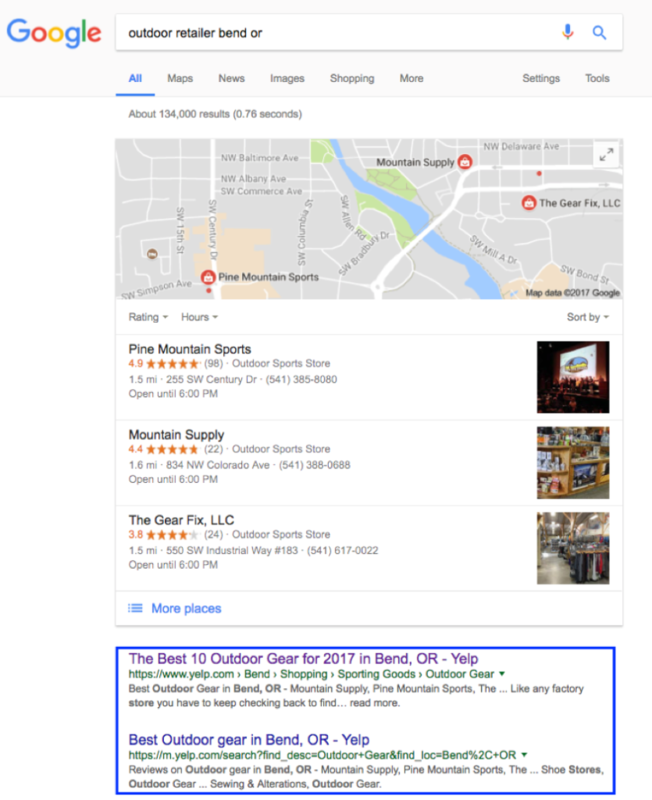 Claiming and verifying a GMB account (Google will send you a verification code to your store location) will allow you to reach customers via the local map pack and map search. It will also ensure customers have correct hours, contact information and location. Add your business name and location (keep reading for more on the importance of maintaining a consistent name, address and phone). Add at least six photos of your business exterior and interior. Select relevant categories and subcategories. Include a link to your website. Respond to business reviews (more on that below, too). Include other relevant business information, such as reservations and menus for restaurants. Pay attention to the categories and subcategories that you select in GMB. These categories should be as close as possible to your business function. Like all good marketing efforts, GMB needs consistent management and maintenance. Upload new photos, and update changes to your hours or location (even for temporary seasonal changes). These actions help keep your GMB listing up to date. GMB now has features such as Google Posts and Google Insights to better help you engage with your local audience and understand their actions. 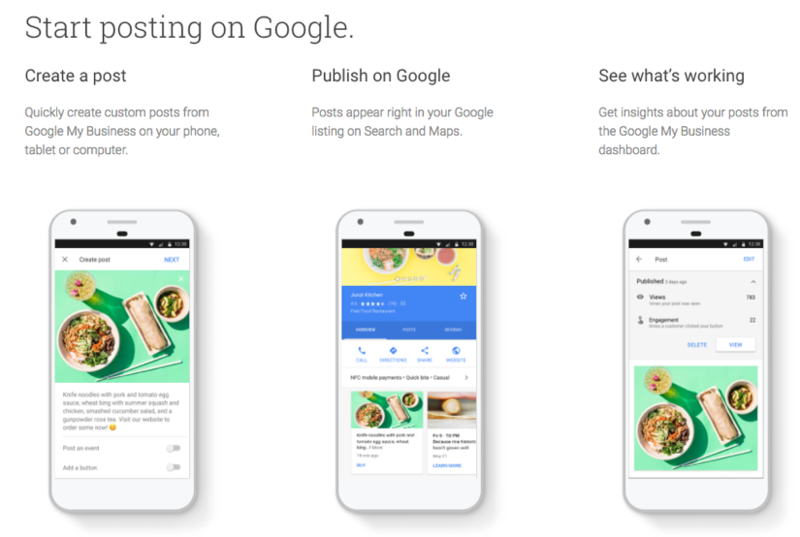 Google Posts allows business owners to include quick posts about events or happenings at their store. If you have special events or promotions, this is a helpful way to boost awareness. Google Insights (located in your GMB dashboard) will report how your users are engaging with your business listing, including phone calls and photo engagement. In addition to using GMB, verify and claim the Bing local counterpart. Bing Places serves the same function as GMB on Microsoft search engines. NAP stands for business name, address and phone. These three items are extremely important for local businesses. Without them, how would someone find your store? Keeping your NAP consistent across all platforms and citations is very important. Use the same NAP across local listing sites (such as GMB), Yelp, social media platforms and any other local directory listing. Notice how these two listings contain roughly the same NAP information. However, the address, city and phone number are slightly different. Even small changes such as the above count as an inconsistent NAP. Choose a NAP format for your business, and stick to it. Every time someone includes your address across the web or it’s listed on a site (such as Yelp), that counts as a citation for your business. The quantity and consistency of these citations are important for local SEO. Ensuring that you have consistent citations across the web can be cumbersome, but thankfully, there are third-party tools that can help. Yext and Localeze are some of the most popular data aggregators that connect to a network of directories and provide a consistent NAP format. These platforms can also help with auditing and updating business citations. 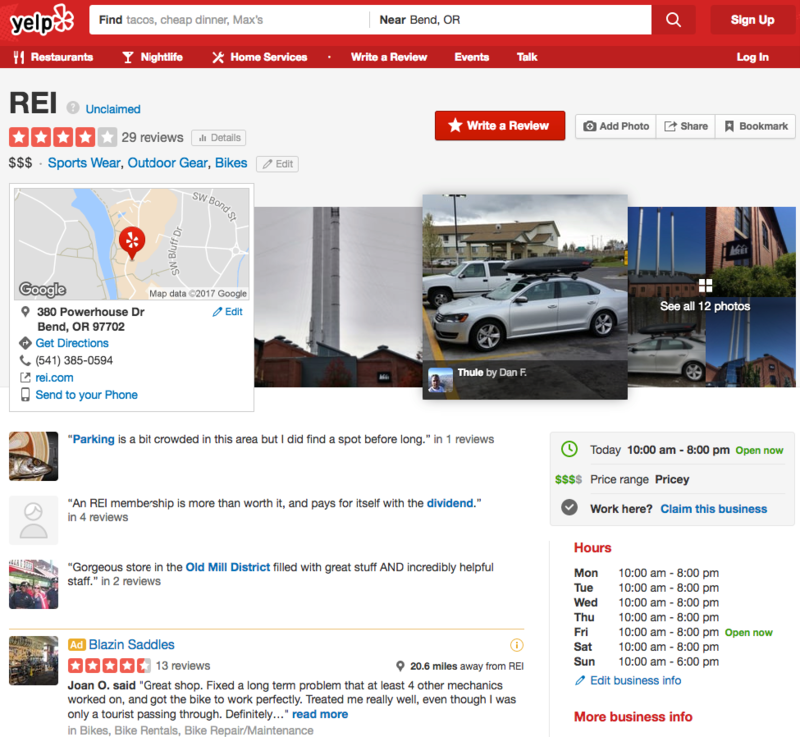 Yelp is another powerful local listing site and one of the most popular consumer review sites. Claim your business location on Yelp, and build your profile with important business information, such as location, contact, photos and more. Businesses can also respond to reviews via Yelp. Having a current, correct and comprehensive Yelp profile can provide more engagement with potential customers as well as more visibility in local search. A BrightLocal survey showed that 88 percent of consumers trust online reviews as much as personal recommendations. If online reviews essentially act as personal reviews and they reach more people, why wouldn’t you want to promote and manage online business reviews? The quality and quantity of reviews can help your business rank better in local search. Reviews on Google will show in the right-hand column (known as the “knowledge graph”) for business-related terms. 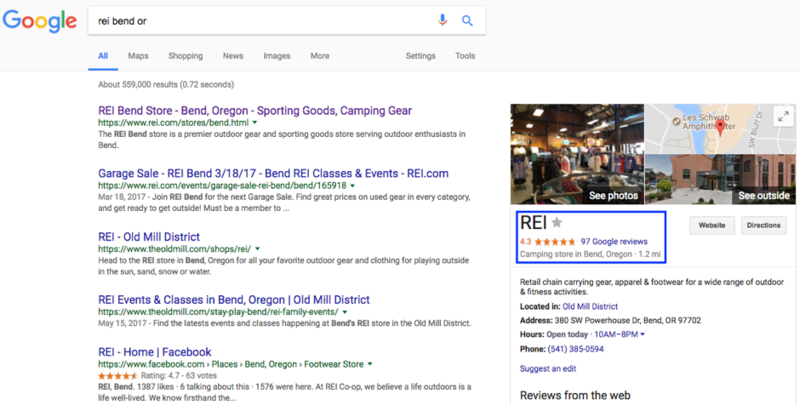 Local businesses should promote their Google or Yelp pages for customers to review (notice how you see Yelp stickers in the windows of stores sometimes?). Businesses should also actively monitor and manage reviews online. Responding to all reviews will show customers that you care about their business. Even more important, responding to negative reviews and trying to take them offline can help alleviate the potential PR damage. Building a loyal social following has many benefits besides just influencing local search. Social signals are included in the top eight local SEO ranking factors both for the local map pack and organic results, so they are important to pay attention to. 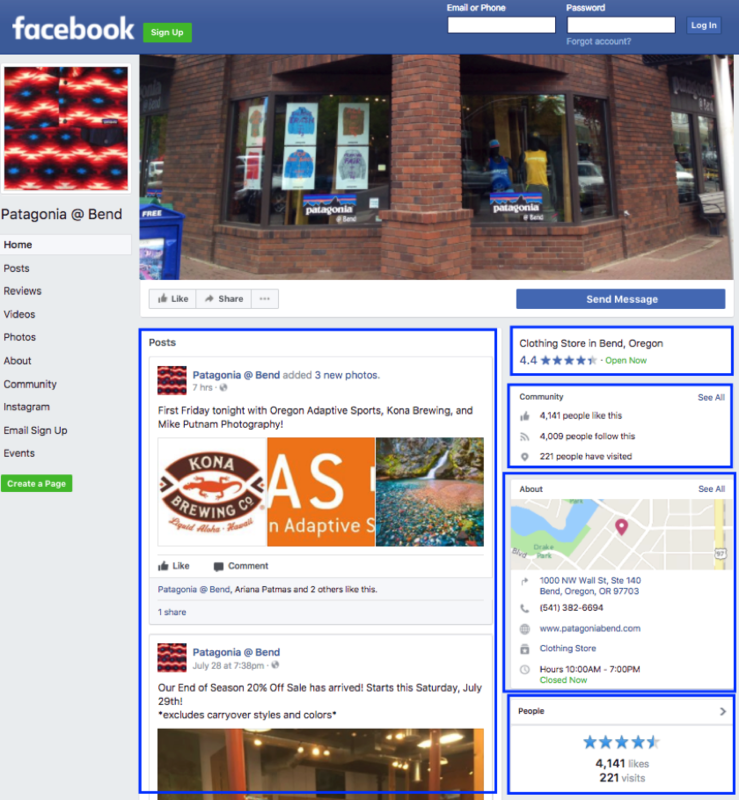 Social platforms provide another venue to build your local brand and gain customer reviews. Building a strong brand intrinsically helps with organic search visibility. Use your brand’s social profiles as platforms to reach your local audience, extend offers and advertise (Facebook advertising is a great way to target local consumers). Ensure that all social profiles include the proper NAP information and website URL. Backlinks are among the top three ranking factors for organic search and are consistently among the top local SEO rank influencers. Many SEO experts say create great content and the links will come. Yes, that’s true, but it’s not always a given. You need to promote your content so that others are aware it exists. Getting backlinks can be challenging, tedious and time-consuming. Create a backlink development strategy that’s tailored to your audience, business and local area. Once you have a plan in place, it will take the guesswork out of executing. Listing in local business directories (such as the Chamber of Commerce). Google claims that one-third of all mobile searches are local. ComScore recently conducted a survey that showed 78 percent of all local-mobile searches resulted in an offline purchase — and usually within a few hours. That’s huge! Ensuring that your business has a mobile-friendly website is fundamental for SEO. This includes ensuring your website is usable on mobile or tablet devices and also that you have visible call-to-actions, such as a clickable phone number or easy-to-find directions to your store. If you’re working with a web developer, they should be able to incorporate mobile-friendly practices into your website. If you’re building your own website, most themes should have a mobile-friendly option. Google’s preferred option for mobile websites is a responsive design that changes based on the user’s screen size. However, there are alternative options, such as adaptive or separate mobile sites. Once your site is optimized for mobile, check using Google’s mobile-friendly testing tool or via Google Search Console’s mobile usability report. Understanding your audience is key when it comes to creating relevant content for your website. For organic search, it’s understanding the keywords that your audience is using in a search. When developing and optimizing content for your website, keyword research should be your first step. This will help you identify how users are searching and what they’re looking for. Understanding target keywords and phrases will help fine-tune important elements that display in search results and the web copy on the page. Keyword research will also help you identify types of content to create to capture your local audience. 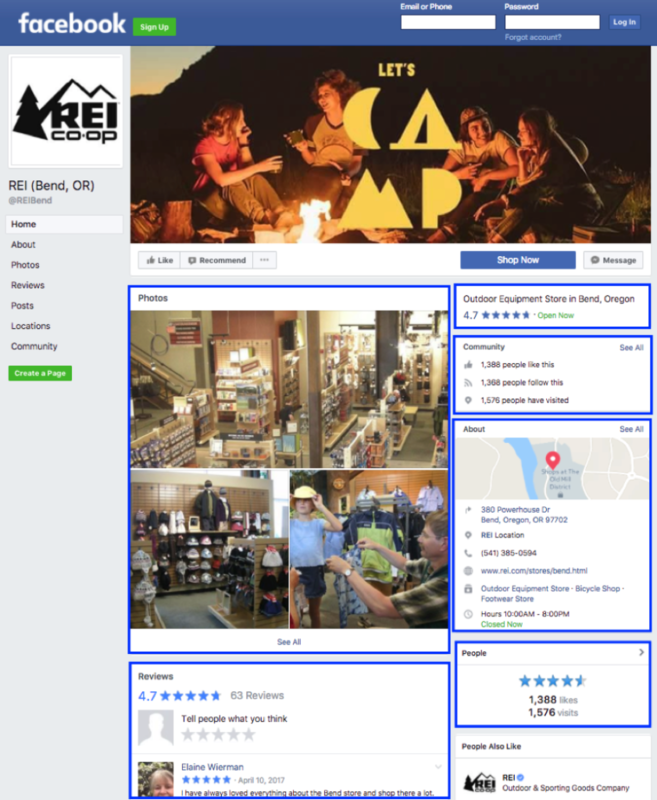 For example, if I’m an outdoor retailer in Bend, Oregon, I might want to write about popular hiking trails or accessible mountain biking trails. This content would be relevant to my business and the local area. Creating a standalone page for your business location is equally important for a company with one location as it is a company with multiple locations. Developing an individual page for your business location(s) will provide an opportunity to include specific, localized content and NAP and business information. This will help your business location rank better in search. 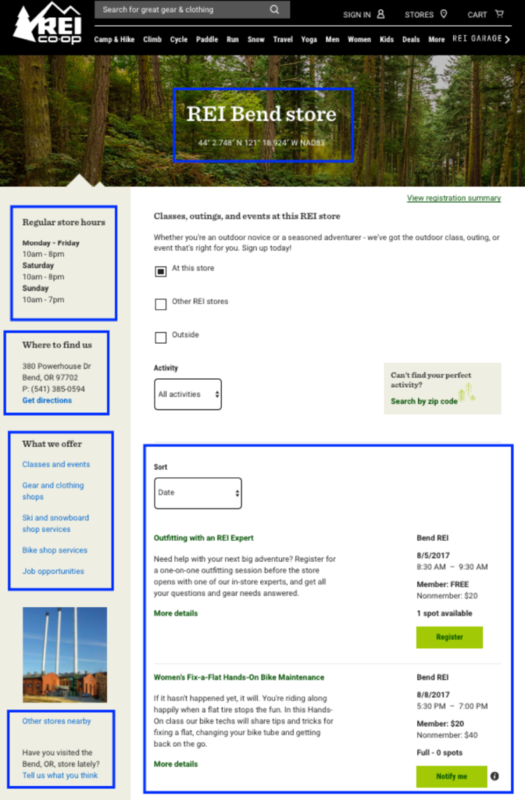 Although a larger retailer, REI does a great job optimizing their individual business location pages. Include the location in the title tag, meta description and h1 heading tag for the page. This will ensure that users know the store is relevant to their location on the search results page. 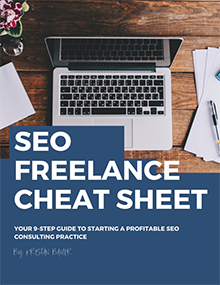 Hopefully, this local SEO guide for small businesses was helpful. If you have any additional questions about local search and SEO for small businesses, please respond in the comments below!